Our Gardens is the quarterly journal of the Garden Clubs of Australia Inc and each issue features articles by well-known garden writers and regular contributors on plant cultivation, garden history, flower arranging, book reviews and horticultural events. The journal is available to members of affiliated clubs through their own club secretary but is also available by direct subscription. Enquiries are welcome from potential advertisers of products of interest to gardeners or flower arrangers etc.Barb Wilson, N.E. 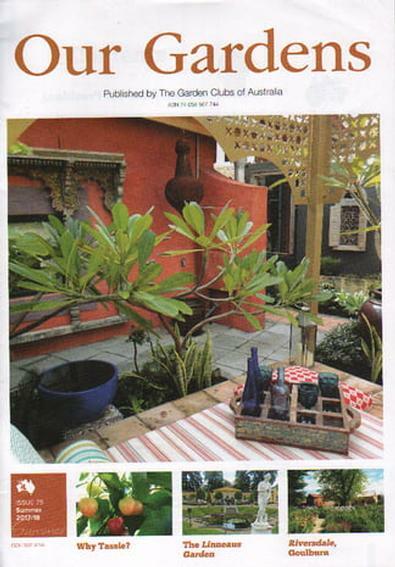 Horticultural Society, Tasmania says " We all enjoy Our Gardens magazine. Well done to the Journal team."